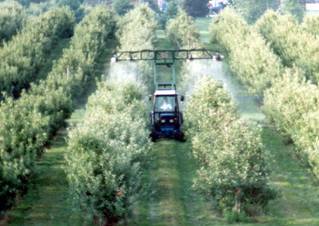 Proptec sprayers provide superior canopy penetration and coverage for the best disease control. Proptec sprayers reduce the amount of water needed which covers more acres per tank. It is common to see savings of 35% or more on pesticides when using a Proptec sprayer. Proptec sprayers also produce less drift and drop which allows more efficient use of chemicals and has less potential for adverse impact on surrounding areas. Fan assisted rotary atomizers can infuse large enclosed areas such as greenhouses with a fine mist in a very short period of time. Proptec fan assisted rotary atomizers treat the surface of bulky solids during bin piling operations or on process lines and can be run at a variable rate to match line speeds. When used in plenums, Proptec rotary atomizer’s radial spray pattern produces slower droplets, allowing more time in the airstream for evaporation. There are no reservoirs, catchments, sumps, or other places where liquids can accumulate and grow bacteria and molds. Proptec rotary atomizers provide superior coverage on bulk materials. There are no reservoirs, catchments, sumps, or other places where liquids can accumulate and grow bacteria and molds.